Incorporated in 1983, A. K. Industrial Fabrics, is a highly acclaimed name in manufacturing and exporting a comprehensive range of industrial textiles operating from its head quarters in Kanpur, India. 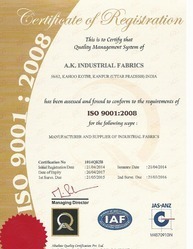 It is a professionally managed company manufacturing high technology Industrial Textiles. We deal in 100% Cotton Canvases, Polyester Cotton Canvases AND 100% Polyester Canvases, which are still most cost effective and environment friendly fabrics for outdoor use. We specialize in increasing the durability and applications of the canvas by utilizing special Ripstop Weaves and Unique Coating treatments, which we have designed indigenously from our long experience and customer feedback. Our fabric treatments protect canvas from Weather Extremes, Tropical Rains, Moulds, Rotting, and Ultra Violet etc. The fabrics can also be given Wrinkle Resistant Treatments, Flame Resistant Treatments, and Oil Resistant Treatments etc. Being a professionally managed company; we assure our customers timely execution of orders and safe delivery of goods in their desired destination. We export our product in Middle East, US, Australia, African countries, New Zealand, Europe. Our team comprises of qualified professionals and experienced workers. We are also supported by highly skilled labor force, who are completely dedicated towards their work and tend to produce premium quality of fabrics. Our marketing professionals work in close co-ordination with the clients so as to produce the product as per their requirement. Our range of fabrics is designed by using the quality yarn in terms of durability, softness, and resistance in extreme weather conditions. We test our products on highly strict parameters to ensure its quality. We strive to offer premium quality products to our clients, by successfully meeting their expectations. Made as per the international quality standards, our range requires minimum maintenance.